Perched above Barbados' fabled Platinum Coast on a breathtaking coral stone cliff, this stunning colonial-style Caribbean villa. 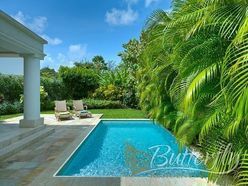 The palatial 9,000 sq ft home and two guest cottages are set within nearly three acres of tropical gardens, just a few hundred yards from beautiful Mullins beach. Shimmering white sand beaches, elegant restaurants and the near year-round tropical climate have made Barbados the favoured vacation destination for stars of music, film and television. The approach to property leads through a sugar cane plantation to a 1,200 ft. drive through landscaped gardens. The main house is entered through a lush atrium garden filled with exotic plants and flowering vines; inside the entrance hall is a spectacular staircase with mahogany handrails and a 23 ft. high window overlooking the pool and sea beyond. 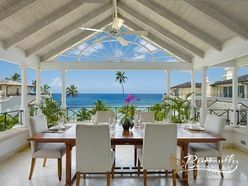 Unobstructed panoramic views from every room sweep down over a rainforest canopy to the sandy shores and aquamarine seas of Mullins and Gibbs Beaches; two of the most acclaimed beaches in the Caribbean. 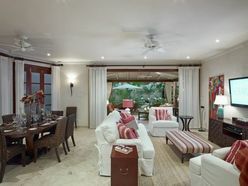 The spacious living room, designed to connect indoor and outdoor entertaining space, is flanked by French doors on each side; one side leads to tropical gardens with charming seating areas, while the other leads to the pool area with outdoor dining facilities, gazebo and spa pool. A large dining room that can seat up to 20 people is served by a kitchen fully equipped with GE appliances that also offers catering facilities for up to 100 guests. The Great House and guest cottages offer a combined six bedrooms and five bathrooms. 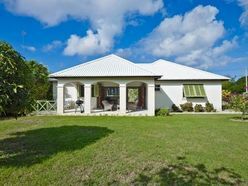 The main house has two guest bedrooms; the master suite, located up the mahogany stairway, has an en suite bathroom, dressing area and private balcony offering views of the pool, gardens and Caribbean Sea. The first, older guest cottage has a bedroom, sitting room, small kitchen and bathroom, while the second, newer cottage has two bedrooms, two bathrooms, a kitchen and private patio area. Pandanus is equipped with a private office with an Apple computer, printer, fax and independent telephone line. An upgraded satellite dish delivers a complete array of international television stations to the dedicated media area on the ground floor. There are also separate staff quarters in the main house. The extensive grounds and all accommodation, both internal and external, are protected by a stateof- the-art security system. The entrance is secured by electronic gates set in a six ft. high perimeter wall, and the estate has a generator to provide electricity in the event of a power outage. An integral garage and storeroom provide a safe home for vehicles and other equipment.